Distinction by Rahab Jordan: Are Sickness, Disease and Oppression Curses for Disobedience? Are Sickness, Disease and Oppression Curses for Disobedience? Many believe the birth of the Messiah rendered the Old Testament laws powerless. They argue that 'we're under grace and no longer under the law'. I don't know if their reasoning for this belief is because they want to have it both ways. Keep committing sin while using a Sunday visit to the church as a means of 'cleansing in the blood'. Or maybe they have been effectively deceived by a false prophet, fake preacher or rejecter of truth. On the other hand, if the birth of the Messiah really did abolish Old Testament Law, a person who doesn't know that and is striving to keep those laws anyway is certainly likely to enjoy even more of the Most High's Divine favor. And keepers of the law will not be among those being punished on the Great Day of Judgment. Moreover, who cares? Keeping the law of righteousness is not an issue for the righteous. When you want to do the right thing, laws that were written to make that happen are appreciated and followed. Not dreaded and rejected. Your businesses and farms will fail. You won't have enough to eat. You'll have only a few children, your crops will be small, and your herds of cattle and flocks of sheep and goats won't produce many young. Yahuah will make you fail in everything you do. No matter what you try to accomplish, Yahuah will confuse you, and you will feel His anger. You won't last long, and you may even meet with disaster, all because you rejected Yahuah. Yahuah will send terrible diseases to attack you, and you will never be well again. you will suffer burning fever and swelling and pain until you die somewhere in the land of your capture. Yahuah will make the sky like a bronze roof that keeps out the rain, and the ground under your feet will become as hard as iron. Your crops will be scorched by the hot east wind or ruined by mildew. He will send dust and sandstorms instead of rain, and you will be wiped out. Yahuah will let you be defeated by your enemies, and you will scatter in all directions. You will be a horrible sight for the other nations to see, and no one will disturb the birds and wild animals while they eat your dead bodies. Yahuah will make you suffer from diseases that will cause oozing sores or crusty itchy patches on your skin or boils like the ones that are common in Egypt. And there will be no cure for you! You will become insane and go blind. Yahuah will make you so confused that even in bright sunshine you will have to feel your way around like a blind person, who cannot tell day from night. For the rest of your life, people will be and rob you and no one will be able to stop them. Your sons and daughters will be dragged off to a foreign country, while you stand there helpless. And even if you watch for them until you go blind, you will never see them again. What you see will be so horrible that you will go insane, and Yahuah will punish you from head to toe with boils that never heal. Even your infant sons and daughters will be taken as prisoners of war. Locusts will eat your crops and strip your trees of leaves and fruit. Foreigners in your towns will become wealthy and powerful, while you become poor and powerless. You will be so short of money that you will have to borrow from these foreigners. They will be leaders in the community and you will be the followers. I mentioned only a few of the curses listed in Deuteronomy 28:15-68. And if you'll notice, the number of curses greatly outnumbers the list of blessings. This is not because YAH is unjust in handling our livelihoods. The truth is it doesn't take a lot of detailing to describe a life of peace and prosperity. Those two words say everything and include every aspect of life. 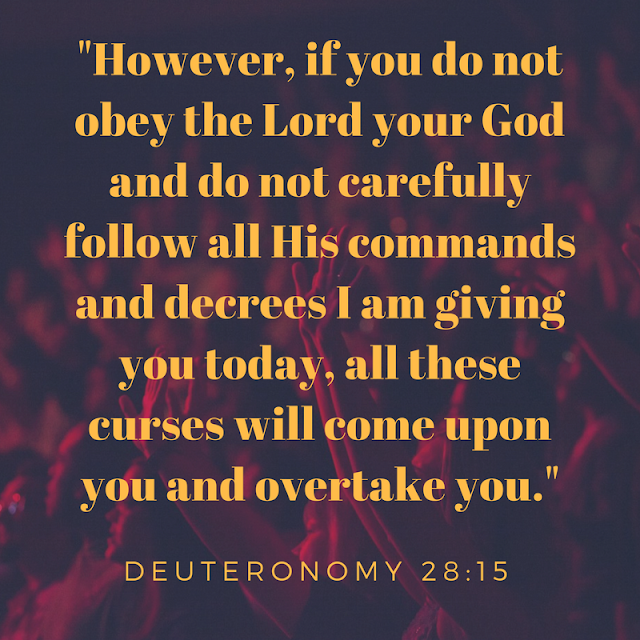 Take the time to read the 28th chapter of Deuteronomy. You be the judge. You decide whether we are witnessing and experiencing some or all of these curses today. Then settle it in your heart whether you still believe the Old Testament Laws don't apply to life after the Sacrificial Lamb of Elohim.